Norse religion refers to the religious traditions of the Norsemen prior to the Christianization of Scandinavia, specifically during the Viking Age. It is a folk religion, which was not necessarily formalized nor categorized as a subset of Germanic paganism until it was described by outsiders who came into contact with native practitioners. It was the northern variation of the religion practiced in the lands inhabited by the Germanic tribes across most of Northern and Central Europe prior to Roman and Holy Roman incursions. Knowledge of Norse religion is mostly drawn from the results of archaeological field work, etymology and early written materials as it was largely a product of earlier people who did not have a written history. 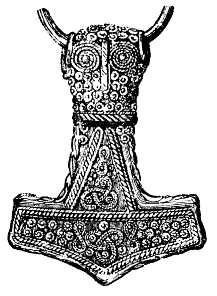 Mjölnir pendants were worn by Norse pagans during the 9th to 10th centuries. This drawing of a 4.6 cm gold-plated silver Mjolnir pendant was found at Bredsätra in Öland, Sweden. Norse religion was a cultural phenomenon, and — like most pre-literate folk beliefs — the practitioners probably did not have a name for their religion until they came into contact with outsiders or competitors. Therefore, the only titles bestowed upon Norse religion are the ones which were used to describe the religion in a competitive manner, usually in a very antagonistic context. Some of these terms were hedendom (Scandinavian), Heidentum (German), Heathenry (English) or Pagan (Latin). A more romanticized name for Norse religion is the medieval Icelandic term Forn Siðr or "Old Custom". Knowledge about Norse religion has been gathered from archaeological discoveries and from literature produced after the Christianization of Scandinavia. 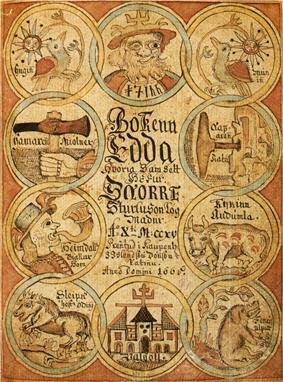 An 18th century copy of the Prose Edda, one of the key literary sources for Norse mythology. The literary sources that reference Norse paganism were written after the religion had declined and Christianity had taken hold. The vast majority of this came from 13th century Iceland, where Christianity had taken longest to gain hold because of its remote location. The key literary texts for the study of Norse paganism are the Prose Edda by Snorri Sturluson, the Gesta Danorum by Saxo Grammaticus and the Poetic Edda, by an unknown writer or writers. Saga literature informs us of the mentalities not only of the literate elite, but also to some extent it gives insight to the mentalities of the illiterate laymen. Sagas are categorized on the basis of when events described in the saga took place. Though Sagas are often mythical in nature the authors' ambitions are to give a realistic description of past events. Snorri Sturluson in Heimskringla outlines why these sagas are to be taken as being accurate, in reference to given inaccuracies in the literature on his own part, he states: “that would be mockery and not praise”. Many sites in Scandinavia have yielded valuable information about early Scandinavian culture. The oldest extant cultural examples are petroglyphs or helleristninger/hällristningar. These are usually divided into two categories according to age: "hunting-glyphs" and "agricultural-glyphs". The hunting glyphs are the oldest (ca. 9,000–6,000 BCE) and are predominantly found in Northern Scandinavia (Jämtland, Nord-Trøndelag and Nordland). These finds seem to indicate an existence primarily based on hunting and fishing. These motifs were gradually subsumed (ca. 4,000–2,000 BCE) by glyphs with more zoomorphic, or perhaps religious, themes. The glyphs from the region of Bohuslän are later complemented with younger agricultural glyphs (ca. 2,300–500 BCE), which seem to depict an existence based more heavily on agriculture. These later motifs primarily depict ships, solar and lunar motifs, geometrical spirals and anthropomorphic beings, which seem to ideographically indicate the beginning of Norse religion. Other noteworthy archaeological finds which may depict early Norse religion are the Iron Age bog bodies such as the Tollund Man, who may have been ritually sacrificed in a seemingly religious context. Later, in the pre-Viking and Viking age, there is material evidence which seems to indicate a growing sophistication in Norse religion, such as artifacts portraying the gripdjur (gripping-beast) motifs, interlacing art and jewelry, Mjolnir pendants and numerous weapons and bracteates with runic characters scratched or cast into them. The runes seem to have evolved from the earlier helleristninger, since they initially seemed to have a wholly ideographic usage. Runes later evolved into a script which was perhaps derived from a combination of Proto-Germanic language and Etruscan or Gothic writing. However, this origin has not been proven, and many runic origin theories have been advocated. Many other ideographic and iconographic motifs which may portray the religious beliefs of the Pre-Viking and Viking Norse are depicted on runestones, which were usually erected as markers or memorial stones. These memorial stones usually were not placed in proximity to a body, and many times there is an epitaph written in runes to memorialize a deceased relative. This practice continued well into the process of Christianization. Like most pre-modern peoples, Norse society was divided into several classes and the early Norse practiced slavery in earnest. The majority of interments from the pagan period seem to derive primarily from the upper classes, however many recent excavations in medieval church yards have given a broader glimpse into the life of the common people. Gamla Uppsala, the centre of worship in Sweden until the temple was destroyed in the late 11th century. The Germanic tribes rarely or never had temples in a modern sense. The blót, the form of worship practiced by the ancient Germanic and Scandinavian people, resembled that of the Celts and Balts; it could occur in sacred groves. It could also take place at home and/or at a simple altar of piled stones known as a hörgr. However, there seems to have been a few more important centres, such as Skiringsal, Lejre and Uppsala. Adam of Bremen claims that there was a temple in Uppsala with three wooden statues of Thor, Odin and Freyr, although no archaeological evidence to date has been able to verify this. Remains of what may be religious buildings have been excavated in Östergötland). Devotion to deceased relatives was a mainstay in Norse religion. Ancestors constituted one of the most ancient and widespread types of deity worshipped in the Nordic region. Although most scholarship focuses on the larger community's dedication to more fantastic gods and myths of the Vikings, it is understood that some sort of ancestor worship was probably an element of the private religious practices of the farmstead and village. Often in addition to showing adoration to the standard Nordic gods, warriors would toast to “their kinsmen who lay in barrows”. It is often said that the Germanic kingship evolved out of a priestly office. This priestly role of the king was in line with the general role of goði, who was the head of a kindred group of families (for this social structure, see Norse clans), and who administered the sacrifices. Sacrifice could comprise inanimate objects, animals or humans. Amongst the Norse, there were two types of human sacrifice; that performed for the gods at religious festivals, and retainer sacrifice that was performed at a funeral. An eye-witness account of retainer sacrifice survives in Ibn Fadlan's account of a Rus ship burial, where a slave-girl had volunteered to accompany her lord to the next world. Reports of religious sacrifice are given by Tacitus, Saxo Grammaticus and Adam of Bremen. The Heimskringla tells of Swedish King Aun who sacrificed nine of his sons in an effort to prolong his life until his subjects stopped him from killing his last son Egil. According to Adam of Bremen, the Swedish kings sacrificed males every ninth year during the Yule sacrifices at the Temple at Uppsala. The Swedes had the right not only to elect kings but also to depose them, and both king Domalde and king Olof Trätälja are said to have been sacrificed after years of famine. Odin, the chief god of the Norse, was associated with death by hanging, and a possible practice of Odinic sacrifice by strangling has some archeological support in the existence of bodies perfectly preserved by the acid of the Jutland (later taken over by the Daner people) peatbogs, into which they were cast after having been strangled. One of the most notable examples of this is the Bronze Age Tollund Man. However, we possess no written accounts that explicitly interpret the cause of these stranglings, which could have other explanations, such as being a form of capital punishment. Odin himself is hanged on the world tree Yggdrasil in the poem Havamal, and in Gautreks saga, king Vikar is hanged with the words, ‘Now I give you to Odin’. I know that I hung on a windy tree nine long nights, wounded with a spear, dedicated to Odin, myself to myself, on that tree of which no man knows from where its roots run. Havamal, st.138, Rúnatal or Óðins Rune Song. Further evidence of human sacrifice can be preserved for thousands of years in the peat bogs, which were often used in religious ceremonies that included human sacrifice. Another method of human sacrifice was burning to death. The ninth-century Berne Scholia describes how people were burnt in a wooden tub in honor of Taranis, the thunder god (Celtic religion). But the Eyrbyggja saga from the Icelandic Scandinavian influence tradition speak of human sacrifices in honor of the Scandinavian god Thor. Nordic peoples recognized a range of spirits dwelling in particular objects and places, such as trees, stones, waterfalls, lakes, houses, and small handmade idols. These localized deities would receive offerings from religious leaders through the use of Sami sieidi altars, which were placed among the forests and mountain sides which would be designated and restricted for certain deities. These altars were seen as the only means in which to confirm receptiveness of the offerings by the leaders. Localized Deities played a significant role in religiously themed Nordic poems and sagas. In the poem Austrfararvísur (c.1020), the Christian skald Sigvatr complains of not being able to get into to any of the farms around the area of Sweden where he visits because of the diligent celebration of a sacrifice in honor of the elves. These localized deities also held the capacity of being a part of an intimate and personal relationship with the worshiper. It was very common for an individual to have their own personal guardian spirits who would receive personal offerings and relate to the individual's own dynamics. As agriculture developed in the Nordic communities so did the use of agricultural deities. As Norse life depended more and more on the factors that affected their crops, they began to dedicate more time to the deities that they believed had control over the weather, seasonal cycle, crops, and other agricultural aspects. 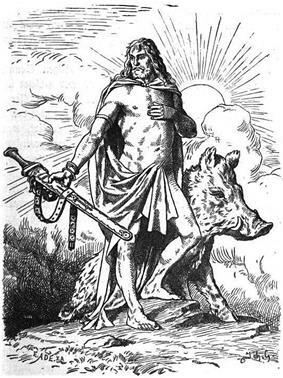 Gods such as Freyr were portrayed as having control over the weather and being a commander of fertility amongst the crops. "Freyr" (1901) by Johannes Gehrts, The god associated with sacral kingship, virility and prosperity, with sunshine and fair weather, and was pictured as a phallic fertility god. Although anthropomorphic in many respects, what is unique about these gods is the enhanced aspects of sexuality, reproduction, and fertility. Not only do these gods have reign over the crops but they were also believed to have a profound effect on livestock, as they were often displayed with horns or animal fur. A mainstay of Agrarian Deities is the use of magic for regeneration, which opens the door for other uses of magic. The Eddaic poem Voluspa portrays Vanir magic as a powerfully potent force used against the Æsir. Similar to many other societies the Viking religions also took interest in the eventual resting place of the dead. The Norse held so much dedication that went into making sure that the dead were cared for properly so that they could enjoy their resting place after death. The use of ghost lore (referred to as Draugr) in the sagas is characteristic of the Norse lore and is directly connected to proper burial practices. Stories and references can be found throughout various sagas including the Laxdæla saga, Eirik's saga, and the Eyrbyggja saga. Ghosts are portrayed as menacing physical presences that intend to injure the living and haunt them. The Laxdæla saga portrays how hauntings often take a menacing and ill hearted turn. These accounts of hauntings and menacing ghosts are often solved through proper burial practices. Burial customs are the primary explanation and solution of the problems faced by ghosts. In Eirik's Saga, Posteinn Eiriksson returns from death for a brief time to critique the handling of the dead. Traces and influences of Norse paganism can still be found in the culture and traditions of the modern Nordic countries; Denmark, Finland, Sweden, Norway, Iceland the Faroe Islands, the Åland Islands, and Greenland, as well as in other countries such as Germany, England, Canada and some parts of British North America and New Spain which were settled by migrants from Nordic nations. Also within the Icelandic language days of the week are influenced by Norse Paganism. Note: Mikudagur in Faroese and Mittwoch in German means Mid-week day. Saturday in English, Samstag in German and Zaterdag in Dutch mean Saturn's Day, after the Roman God Saturn. Festivals were a public celebration of the divine, where the local community or the nation renewed its bonds through shared worship. There were many elements to the Norse festivals, and it depended on which particular festival was being celebrated. Religious sacrifice was just one element of such festivals and holidays. The festivals were more so a place to celebrate one’s communal identity than to gather in a religious capacity. This sense of the communal is underlined by the role of the local leader, whether king, chieftain or householder, in leading the rite. These celebrations also served to reinforce the social bonds between the chieftain and his followers, joining everyone in a single community. Various modern celebrations in Nordic countries have traditions that arose from the festivals of the pre-Christian pagans. The Christian celebration of Christmas, as practiced in Scandinavian nations and elsewhere, is still called Jul and makes use of pagan practises such as the Yule log, holly, mistletoe and the exchange of gifts. The celebration of Jul has gradually moved towards a secular event rather than a religious. Depending on definition between 45 and 80% of Scandinavians are non-religious. Midsummer, the celebration of the summer solstice, is an Old Norse practice still celebrated in Denmark and Germany (St John's Eve), Finland, Sweden, Estonia, Latvia and Norway, and in towns across Canada, Greenland and British North America that were settled by Scandinavians. Norse paganism was the inspiration behind the Neopagan religions of Asatru and Odinism, which originated in the 20th century. They are both subsets of the larger Germanic neopaganism. ^ "Norse Heathenism". Retrieved 27 April 2012. ^ a b Auerbach, Loren (1999). The Encyclopedia of World Mythology. Parragon. ^ Nedkvitne, Arnved (2009). Lay Belief in Norse Society. Copenhagen: Museum Tusculanum Press. p. 34. ^ Nedkvitne, Arnved (2009). Lay Belief in Norse Society. Copenhagen: Museum Tusculanum Press. p. 35. ^ Sturleson, Snorro. The Heimskringla, or, Chronicle of the kings of Norway. ^ Gislason, Jonas (1990). Acceptance of Christianity in Iceland in the Year 1000:"Old Norse and Finnish Religions and pagan Place-Names. Donner Institute for Research in Religious and Cultural History. pp. 223–255. ^ Sturluson, Snorri (1941). Froenda sinna, peira er heyfdir hofou verit. Heimskringla: Hakonar saga Goda. p. 168. ^ Ewing, Thor. p. 18. ^ Ewing, Thor. p. 19. ^ Sturluson, Snorri (1964). The Prose Edda Tales Mythology. California: University of California Press. p. 78. ^ a b Dubois. p. 54. ^ Dunn, Charles (1990). "Poems of the Elder Edda". Volupsa. California: University of Pennsylvania Press. p. 9. ^ Sephton, J. "The Saga of Erik the Red". 1880. Icelandic Saga Database. Retrieved 26 April 2012. ^ a b c Nedkvitne, Arnved. p. 79.